Planting bulbs is simple. But before you start the planting process, be sure the chosen spot has good, well-draining soil. Bulbs rot in soggy ground and struggle in sandy soil; although adding some organic matter can ease these problems considerably, it is still in your best interest to select a location that resembles an ideal environment for your bulbs. Dig an appropriately sized hole. If you’re planting only a few bulbs or you’re spot-planting (tucking bulbs in among other plants in a mixed bed), use a trowel. If you’re planting lots of bulbs, break out the shovel and make a trench. Not all bulbs are the same size, so not all bulbs should be planted the same depth. The general rule is three times as deep as the bulb‘s height. This guideline varies a bit based on your soil type. In sandier soils, you can plant a little deeper; in heavy clay soils, a little shallower. If you forget how deep to plant your bulbs, consult the supplier’s label or catalog. Too shallow, and your bulbs may poke their heads above the soil surface too early and get damaged by wintry weather; too deep, and they’ll take longer to emerge. Roots grow out of the bottom of the bulb, so the quality of the soil underneath it is more important than what you pack the hole with. If you’re amending the soil with organic material like compost or sphagnum moss, dig somewhat deeper-than-recommended holes so you can accommodate this addition. Distance apart varies with the type of bulb and the sort of display you have in mind. If you crowd the bulbs underground, the eventual show may suffer. Certainly, don’t let the bulbs touch one another. The general rule is at least three bulb-widths apart “on center“ (from the center of one bulb to the center of the next). But experience can tell you what the bulbs you’ve chosen tolerate and how dense you like your displays. Use a fertilizer that has a higher phosphorus number, such as a 5-10-5 fertilizer. Phosphorus (the P in the N-P-K on fertilizer labels) is important for the root growth as well as flower production. Just sprinkle the fertilizer in the bottom of the hole and scratch it in so it mixes with the soil a bit. If the ground is bone dry, water a day or so before planting so the ground is damp but not muddy when you’re planting the bulbs. If you want to wait to fertilize, you can scratch the fertilizer into the surface of the soil in the spring as the bulbs are growing. 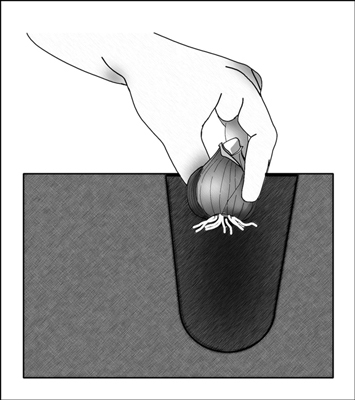 Securely place the bulb’s basal plate against the bottom of the hole. You want the nose, or growing point, to point up and the roots, or basal plate from which they’ll grow, to point down. (If you can’t tell, plant the bulb on its side — the plant will figure it out in due course! Botanists call this nifty skill gravitropism.) Make sure the bottom of the bulb is in contact with soil; if you leave an air pocket, the roots can dry out and the bulb won’t grow or won’t grow very well. Backfill with soil and water generously. As you scoop soil back into the hole, firmly press it in place to prevent air pockets. Water well (some settling will occur) and then add a bit more soil as needed. Indicate where you’ve planted your bulbs so you don’t plant other flowers in the same place. Mark the locations with permanent nonrusting, nonrotting labels like those made of zinc or copper.